Nope, sorry. 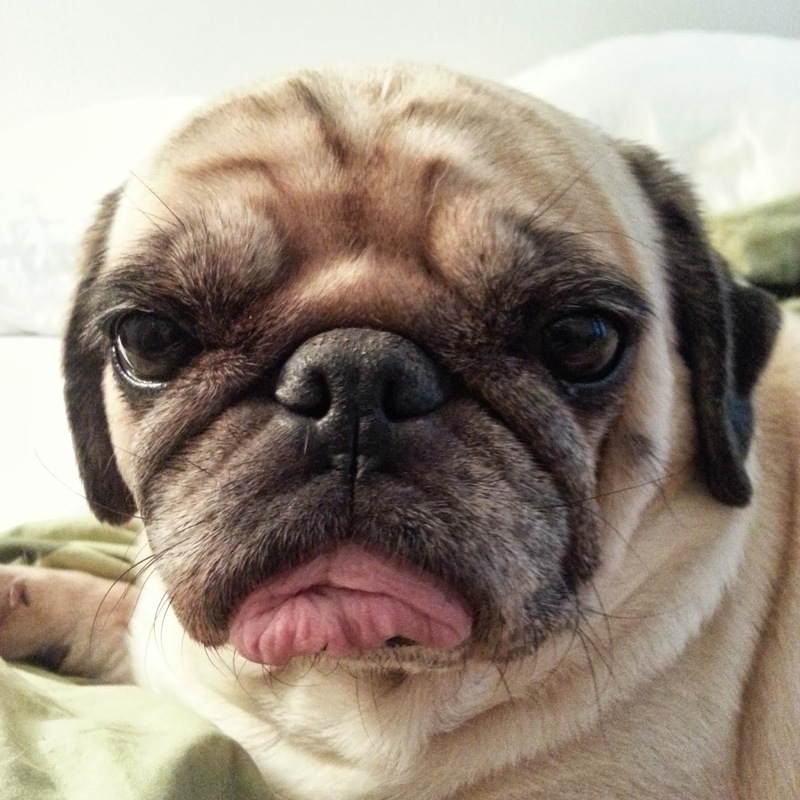 I like having some privacy but you can think of me as Sunny's and Rosy's mom, Bah Humpug, or Funaek. 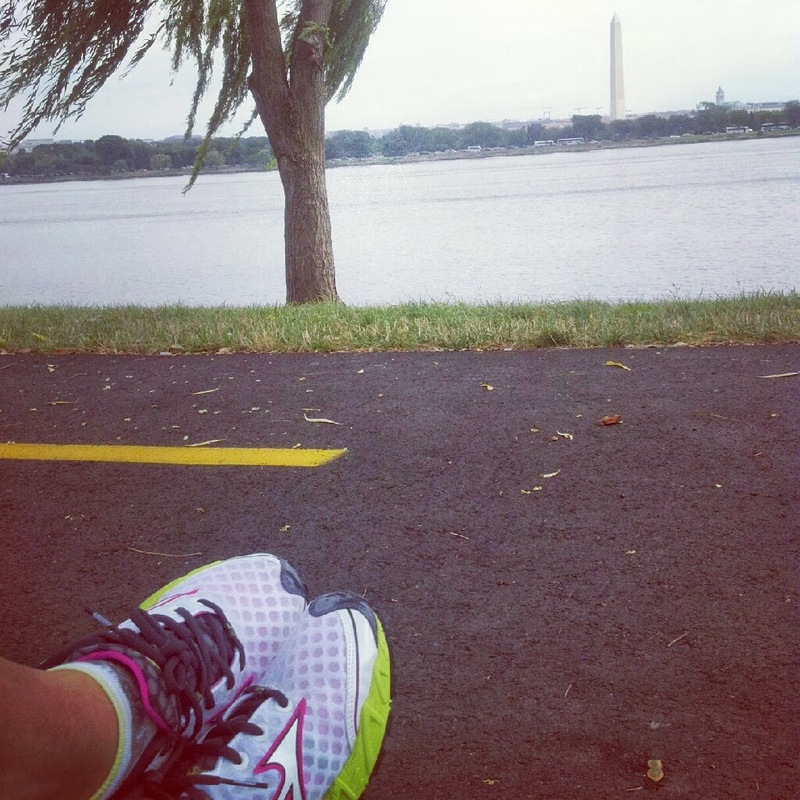 We're in the US, and more specifically in the DC metro area. 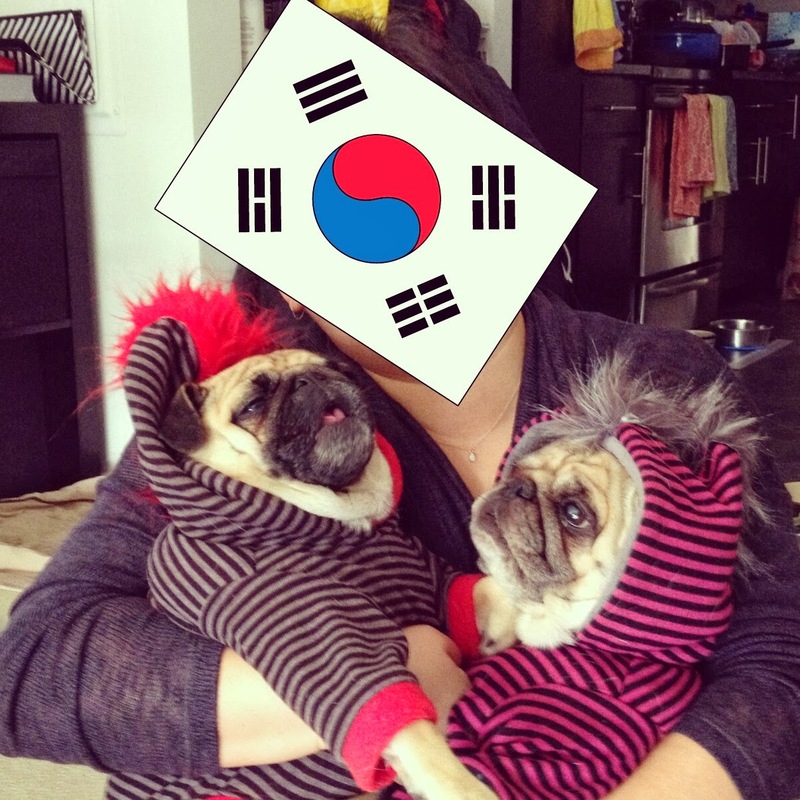 How old are Sunny and Rosy? 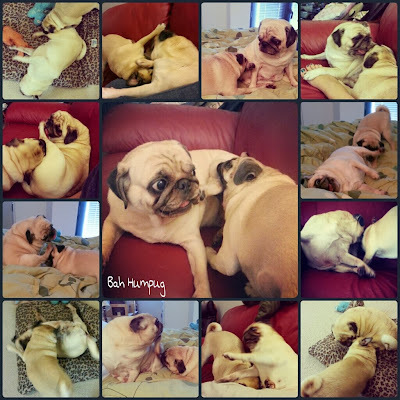 As of the date that I created this FAQs page, 1/21/14, Sunny is 9 and Rosy is 3. 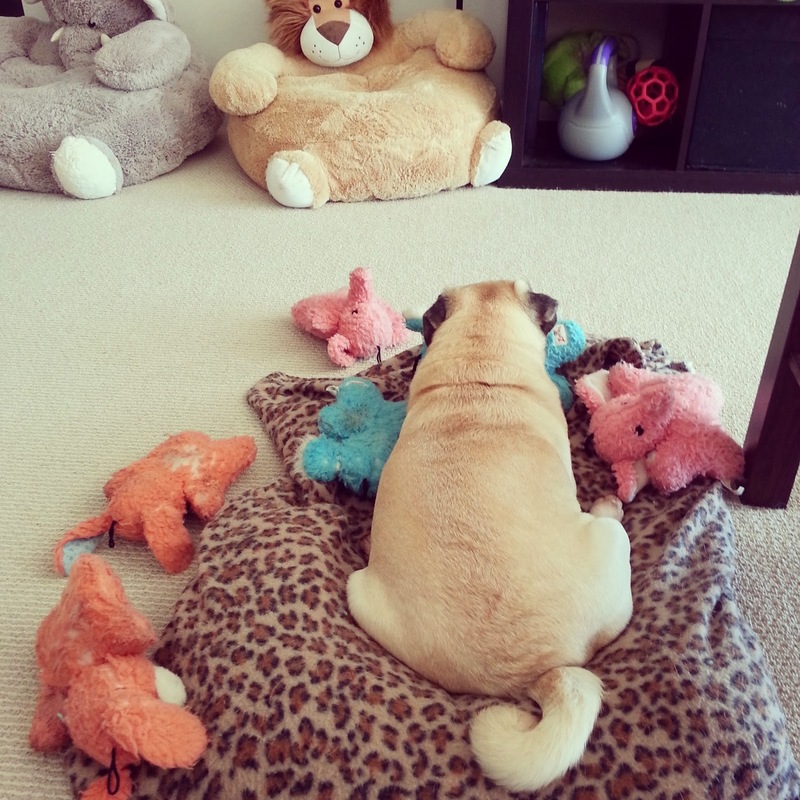 Where did you get Sunny and Rosy from? I got Sunny just before she turned 6 from a breeder that was retiring her. I promptly spayed her and she now leads a luxurious retirement. 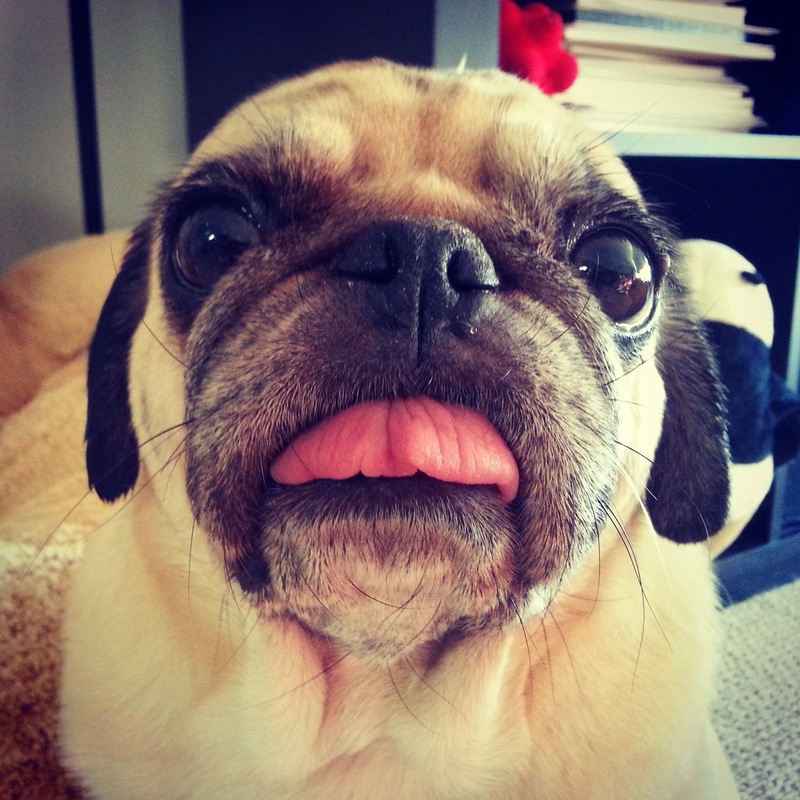 About 2 years after I adopted Sunny I started looking for a second pug. After many false starts, I stumbled across her post on Petfinder from a VA pet rescue (I was stalking Petfinder regularly at this time). A month later I drove over 3 hours to pick her up and she joined the family. Did you name Sunny and Rosy yourself? Sunny and Rosy both came to me already named and answered to those names so I didn't want to change them. I did, however, change the spellings from Sunni to Sunny and from Rosie to Rosy. What do you feed your pugs? After lots of trial and error, I now feed them Acana's grain-free line. I rotate between the Ranchlands and Pacifica lines. We've tried the other ones and the girls either didn't seem to like them as much or they had more tummy issues. Where did you get your dog steps? The steps I got are by Pet Studio and I ordered them through Amazon (link here). I chose them because I wanted sturdy steps that didn't look too hideous and I could easily stow away when I have guests. These steps are strong and have supported me for short periods of time. They also convert into a ramp and can be folded up and slid under furniture. It also has a handle for easy carrying. We love them! What is a BarkBox and why do you keep posting about it? BarkBox is a monthly subscription service where you can sign up for varying plan lengths (though the longer you choose, the cheaper it gets) and each month they send you a box filled with goodies. I forget how I first heard about it but we love it and have had it now for over a year! Each box is usually filled with some treats, toys, and sometimes a useful dog supply/grooming/travel item. The treats are all made in the U.S. or Canada and are often wheat-free, gluten-free, organic, and/or grain-free. 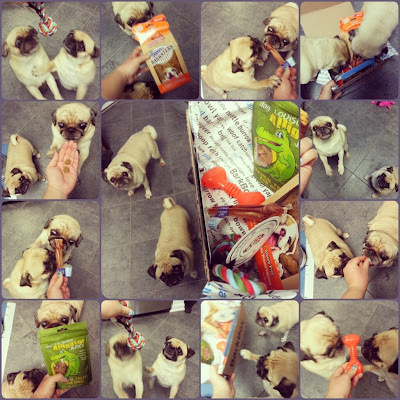 Almost everything you get is full sized, including the toys, and they often include coupons and bully sticks. You really get your money's worth with all the great stuff in the boxes! If your dog is not picky about toys and treats, and doesn't have a food allergy, then I would highly recommend it. What size BarkBox do you get? 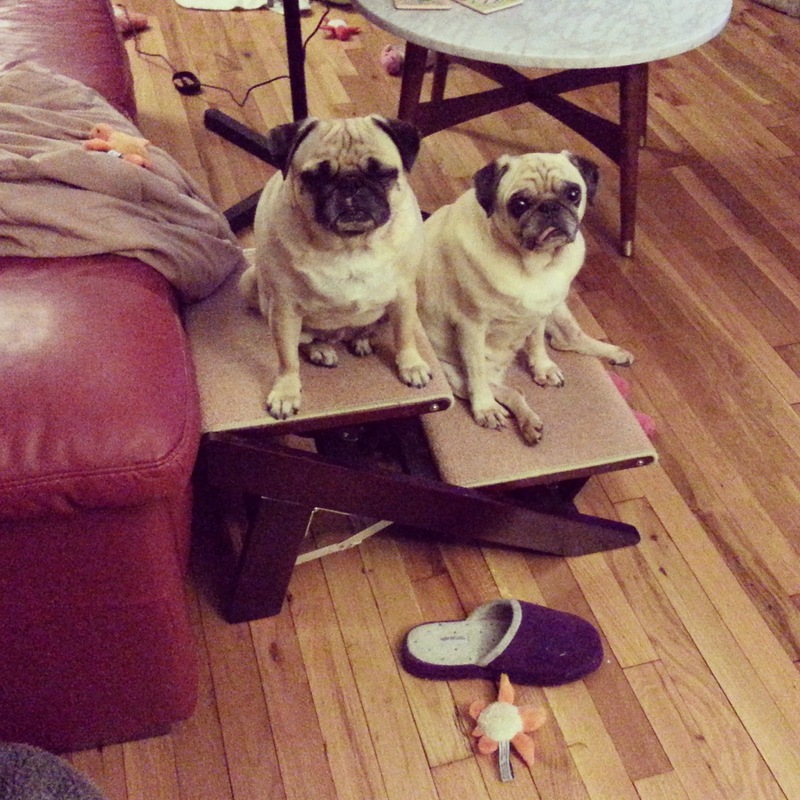 Sunny's about 21 lbs and Rosy's about 17 lbs and we get the small box. While Sunny technically could qualify for the medium box, she likes smaller toys, and I like smaller treats for portion control. 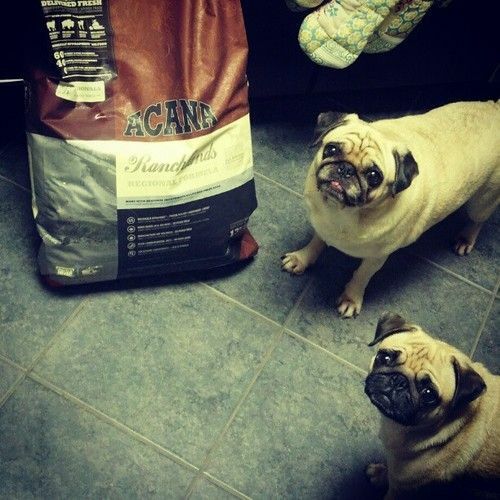 I usually have to break up treats for them anyways. But, I know plenty of pugs that get the medium box and love it. So you should chose the size box by what kind of toys and treats you prefer. Generally the different sized boxes are pretty much the same, except for 1 or 2 differences. Though I've noticed over time that the boxes seem to vary more even within the same size option. Where did you get those animal thrones? Costco! I hate Costco but I will forever be grateful to it for introducing us to these animal thrones. They were in the kids section and I just knew they'd make adorable dog beds. I don't know if they're still there and I saw them on Amazon at one point being sold by third parties but they were crazy expensive on Amazon (at Costco they were about $17). The downside to these chairs is that there is no removable cover so you're supposed to just spot clean. 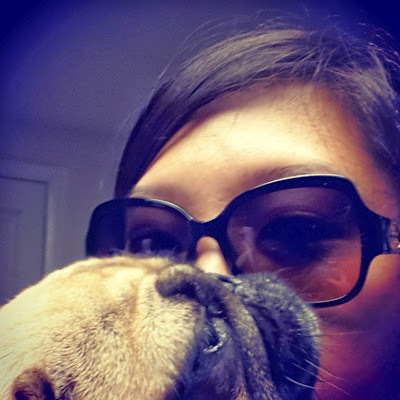 Kinda a pain with stinky pugs. 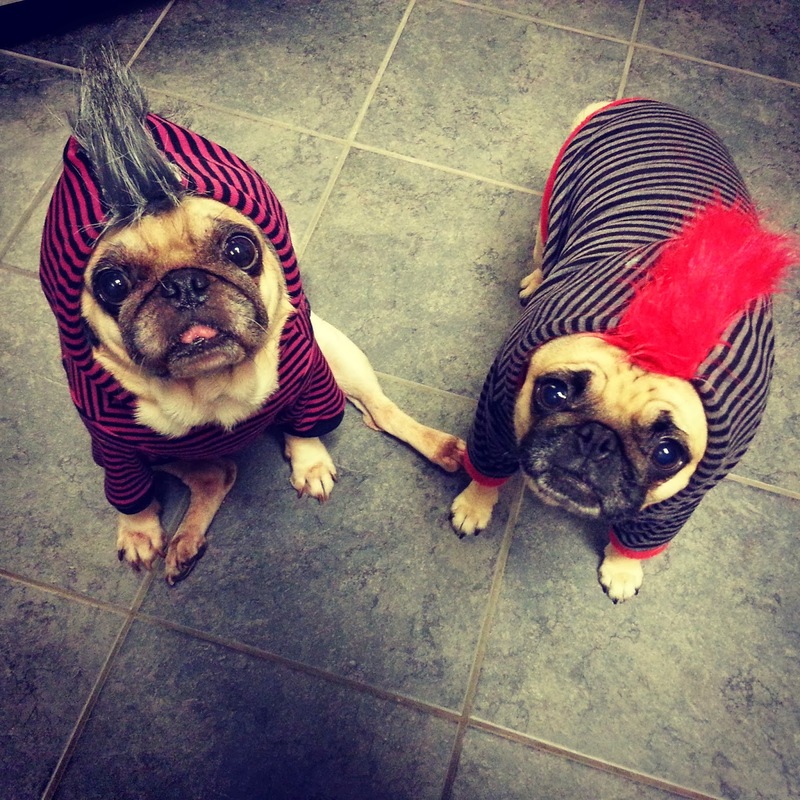 Where did you get those mohawk hoodies? Aren't they fantastic?! They're by etsy seller Pet it Dog Apparel. Sunny and Rosy are both a large, but Sunny needed a teensy bit of room in the girth measurement. The seller is very accommodating with tweaks on available sizes. 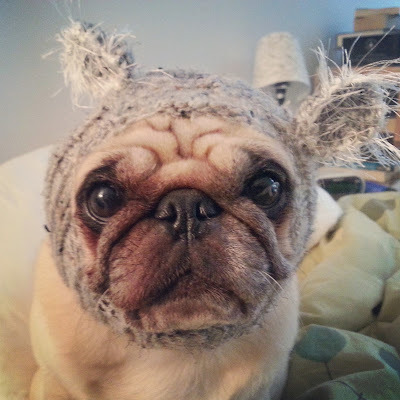 The hood is a bit big though and often falls forward and covers Rosy's eyes. 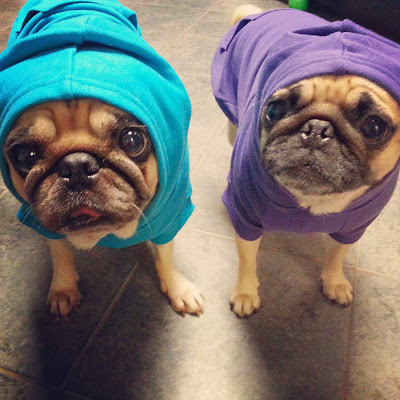 Almost all their hoodies have slits in the back so that you can connect a leash to a harness underneath the hoodie. What about the other hoodies you have? Where did you get those? After the success of the mohawk hoodies, I wanted a less flashy mohawk-less version so I ordered some more from Pet it Dog Apparel. I asked for the hoods to be a bit smaller, but they still don't fit right. I also have a pair from Zack & Zoey that I ordered through Amazon. These are very cute and comfy and also have a slit in the back for the harness, but the slit is very small so I can only fit one loop through it (the girls' harness has a double metal loop). 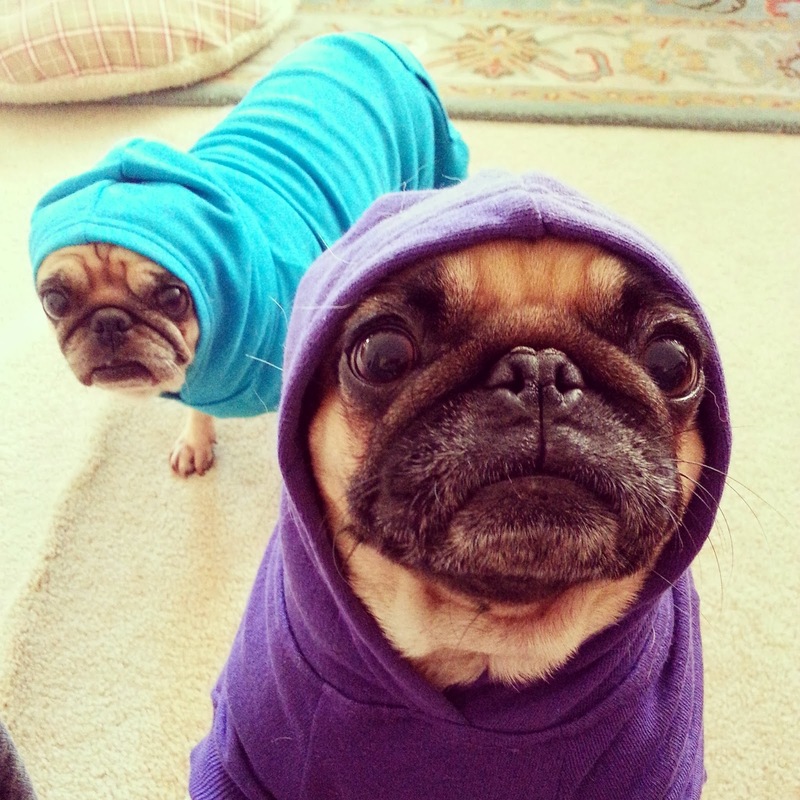 But, the hoodies are too long. And for Sunny who needed the large (Rosy has a medium), it's way too long for her to wear. Rosy's is longish but manageable. 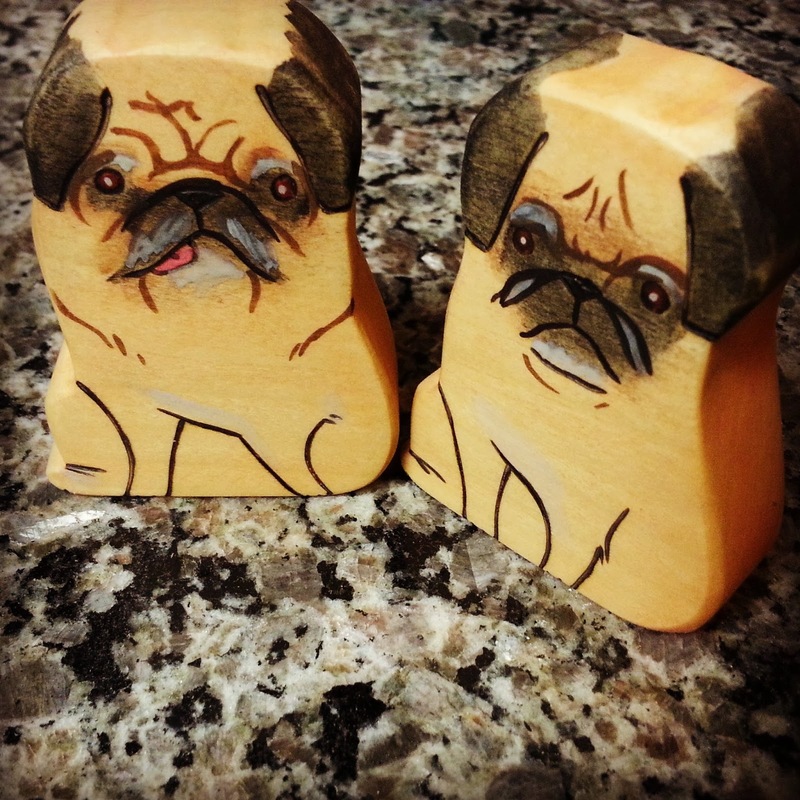 Where did you get the wooden pug figurines? Another great Etsy find! 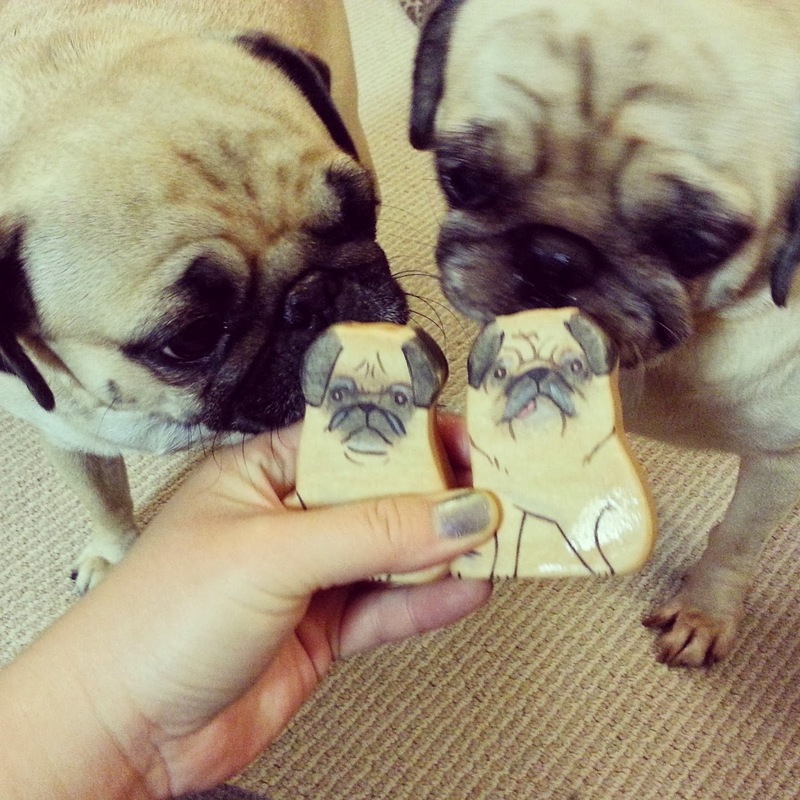 They were custom ordered from Mama Kopp. I gave her a photo of the girls and she designed the figurines after it. They are great and painted on both sides so there's curly tails on the backs! 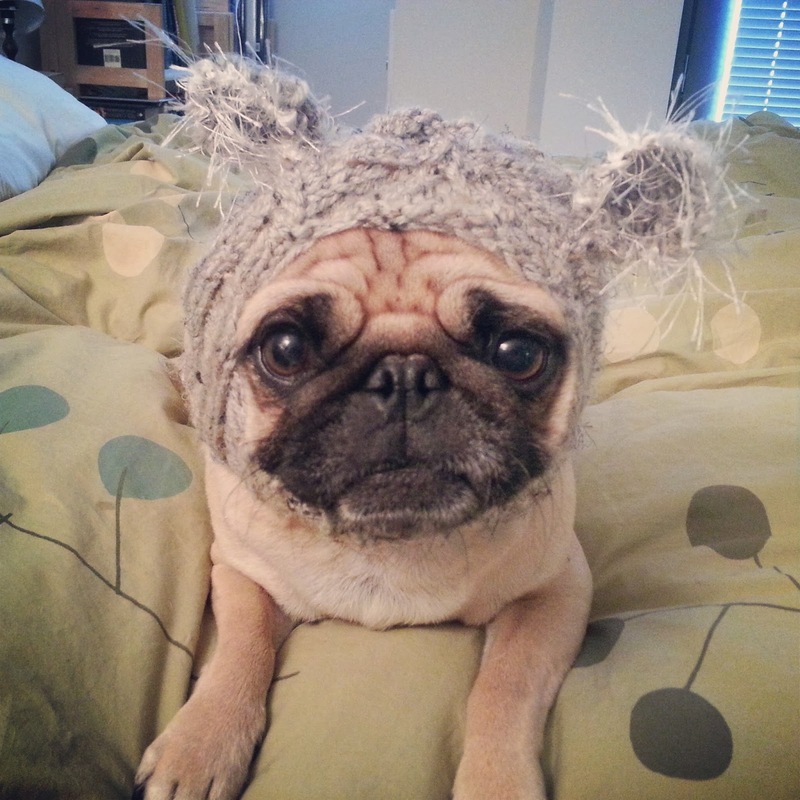 Where did you get that koala hat? Yet another great Etsy find! 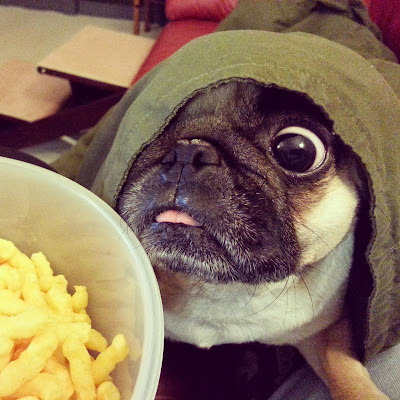 This one came from All You Need is Pug a while ago. The girls both hate it though and usually shake it off after a couple minutes. But the pictures alone are worth it! What leash/harness/collar do you use? 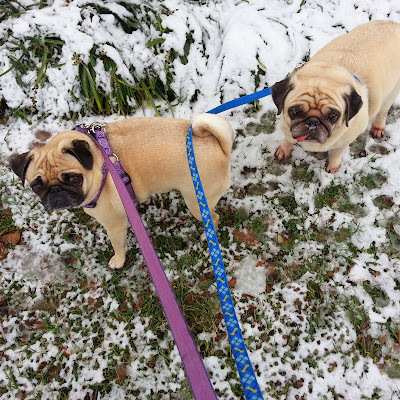 Both of their harnesses are by Lupine and are the step in kind. 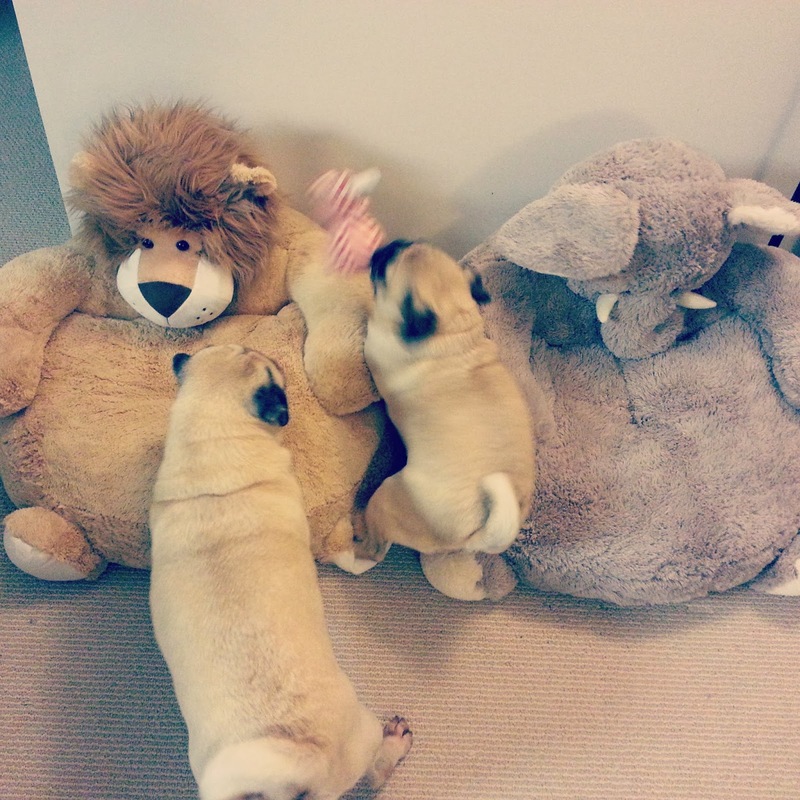 We get the 3/4 inch version, and Sunny gets the 20-30 inch size while Rosy gets the 15-21 inch size. They're not perfect, but they're our favorite so far. Lupine fits Rosy very well, but on Sunny she can slip out of it sometimes when she backs up and bows her head down (stubborn pug). We tried the popular Puppia kind but found those even worse with the slipping out, and Sunny hates having things slipped over her head. Usually when I walk Sunny I use one of the flexi ribbon leashes since she likes to have space to do her business. The ribbon ones are better than the original flexi leashes with the cords which could be very dangerous. 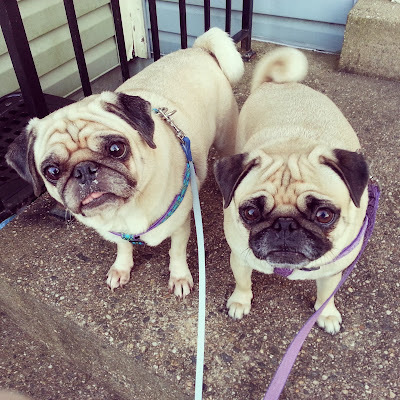 Rosy's collar is also by Lupine, but Sunny's is a "hipster" collar from Stinky & Sweet Pea. 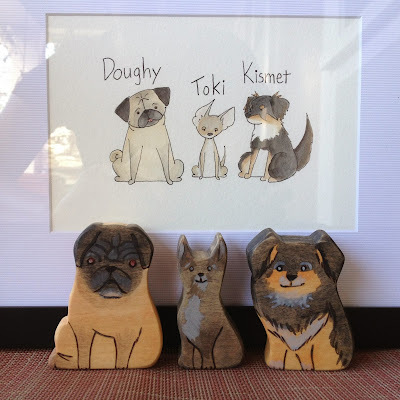 Do you do personal request drawings? Unfortunately, unless you're my demanding sister and it's Christmas or her birthday, then no. I don't have the time to accept personal requests. My sister is the only one who is able to guilt me into doing personal drawings for her, like the one below, but she's got the blood connection with me and also embarrassing stories from our childhood to blackmail me. Part of the reason why I can't do personal requests is that I work full time as an attorney. 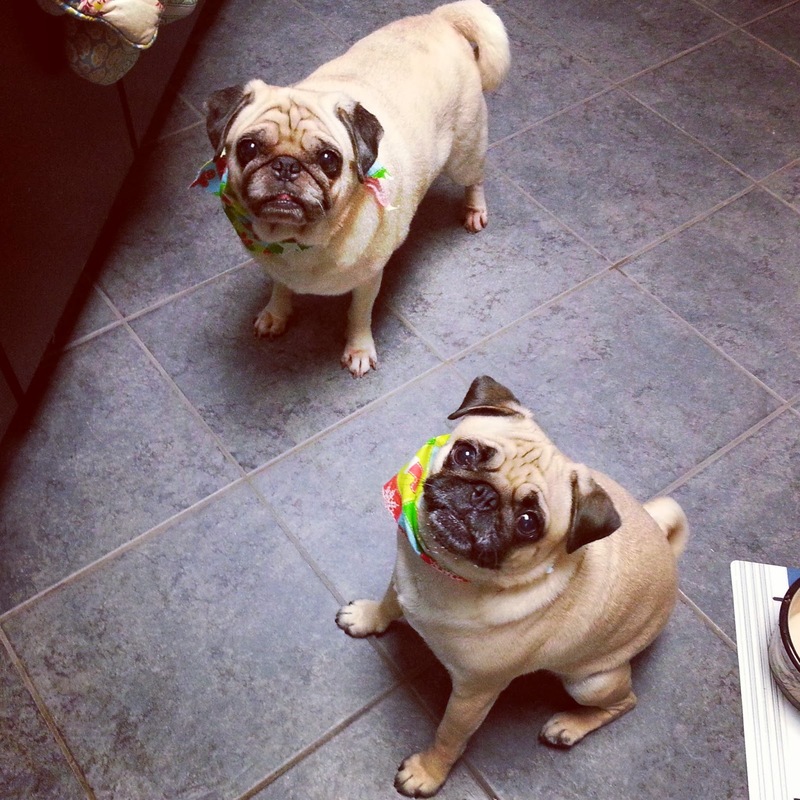 Do you feed your pugs the food you make? I get asked this question all the time when I post photos of my food, even when they're clearly spicy or otherwise bad for dogs! 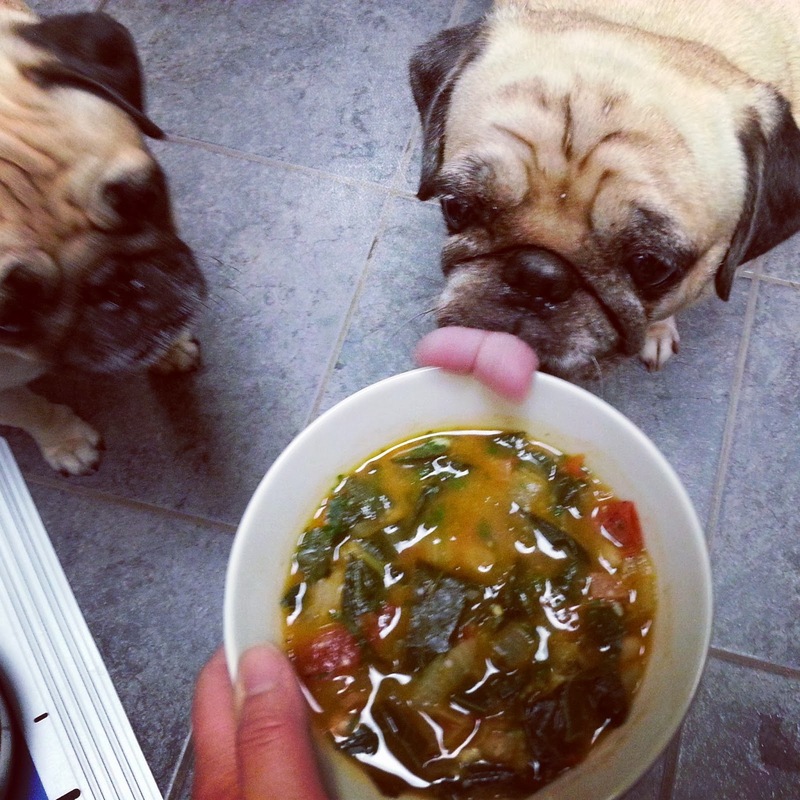 No, I do not feed the girls the food I cook. All that food is for me and my belly! I usually give the girls small bites as I'm cooking of individual ingredients that are ok for dogs, but almost never a taste of the finished product since by then it usually contains spices or onions. The same goes for snack foods I eat. Generally, the girls do not get to share my snack food. I let them clean up dropped bits so long as it's dog-safe, and I do give them bites of popcorn whenever I have it (the fluffy part, not the kernel). 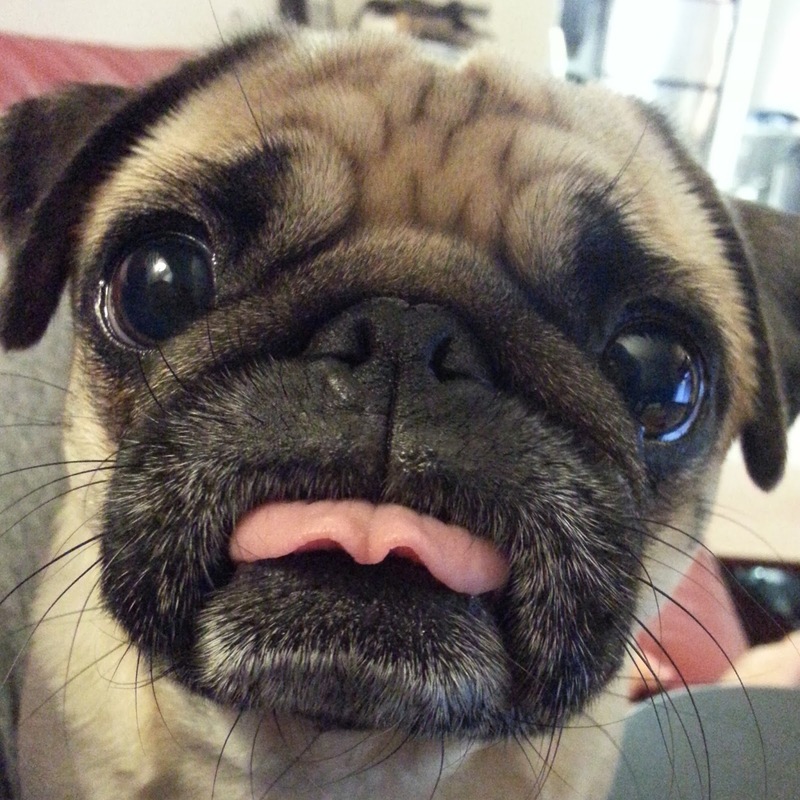 Does Sunny's tongue stick out all the time? And why does it do that? Sunny's tongue sticks out probably 80% of the time. I don't know why but I love it. When I first got her she didn't stick out her tongue that much, but when she got spayed she had to have a bunch of teeth removed and I think she must've lost a gatekeeper tooth because now her tongue sticks out all the time! This happens often when she's sleeping and leads to a hilarious dry, crinkly tongue. And I can never resist booping it! 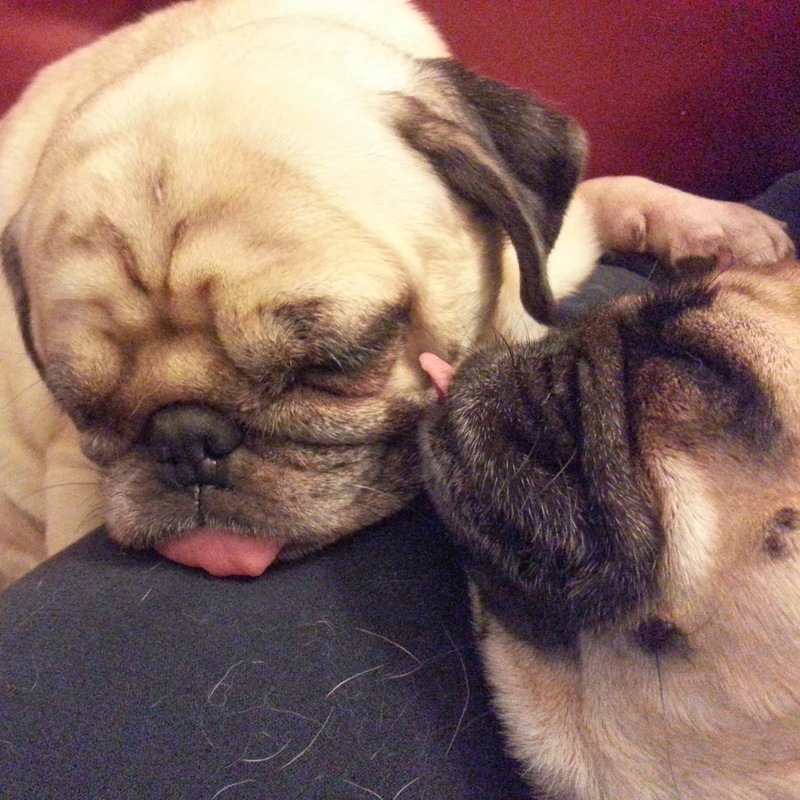 Did Rosy always stick out her tongue, or is that a habit she caught from Sunny? I have no idea! She stuck her tongue out from the beginning occasionally, but I feel like she does it way more nowadays. 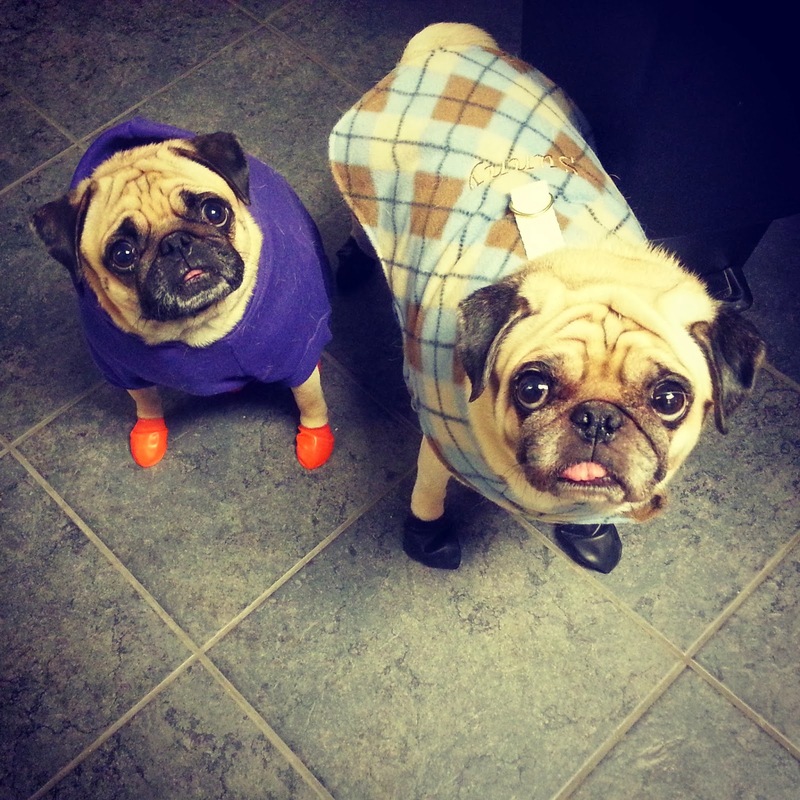 Where did you get those funny booties the girls wear in the snow? Those booties are by Pawz and I usually buy them through Amazon, but have also found them on other dog retail sites, like Wag.com and Chewy.com. Sunny needs a small (black or red) and Rosy can wear a small or x-small (orange). These are rubber booties that are basically glorified balloons. 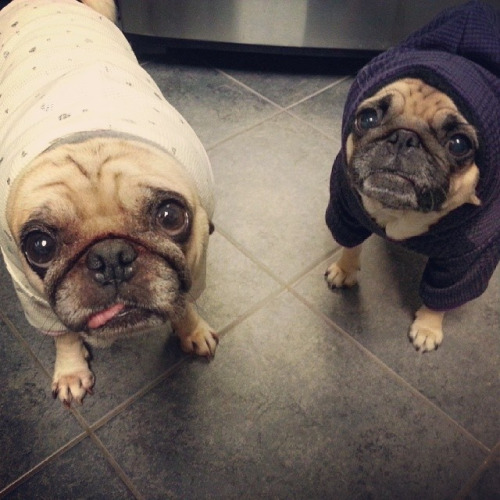 They don't provide much warmth and are so hard to put on, but they're the best ones I've found for my pugs. The main advantage to these compared to other booties, is that they're thin enough that dogs can feel the ground through the booties so it makes it easier to walk. When I tried real booties on Sunny she just wouldn't walk at all and just stood there with her tail uncurled. They still don't love these, but they tolerate them. Putting them on though is still a pain. Why does Sunny sit so funny? 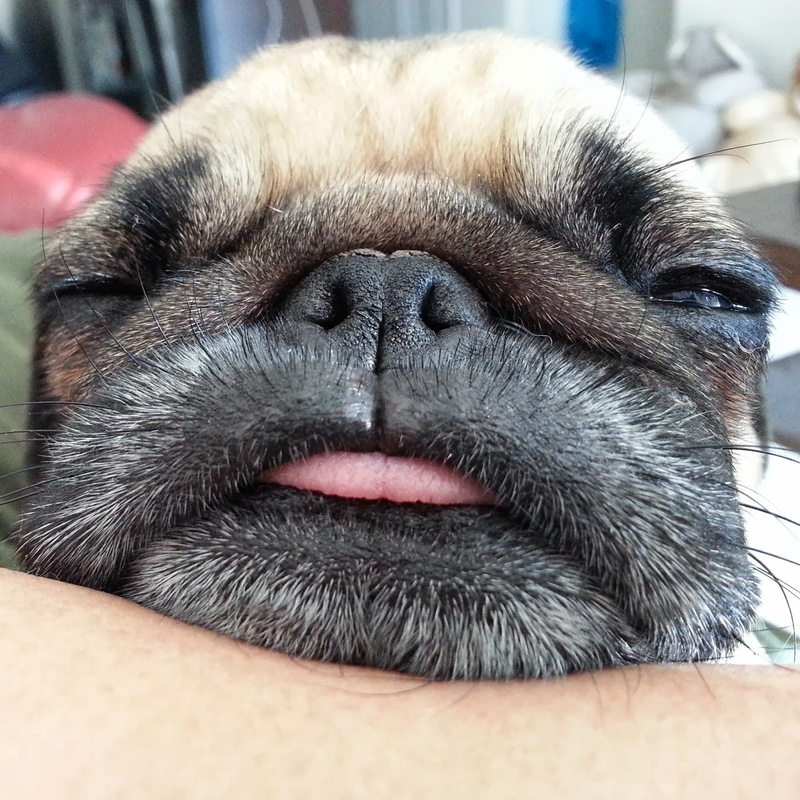 That is known as the pug slump. 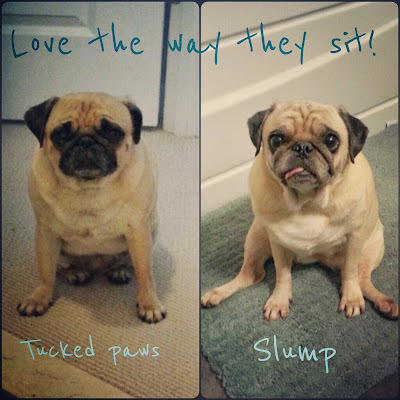 She's a master slumper! Rosy doesn't really slump so much but I'm wondering if she might as she gets older. How many toys do the girls have? How often do you bathe the girls? Do you do it yourself? 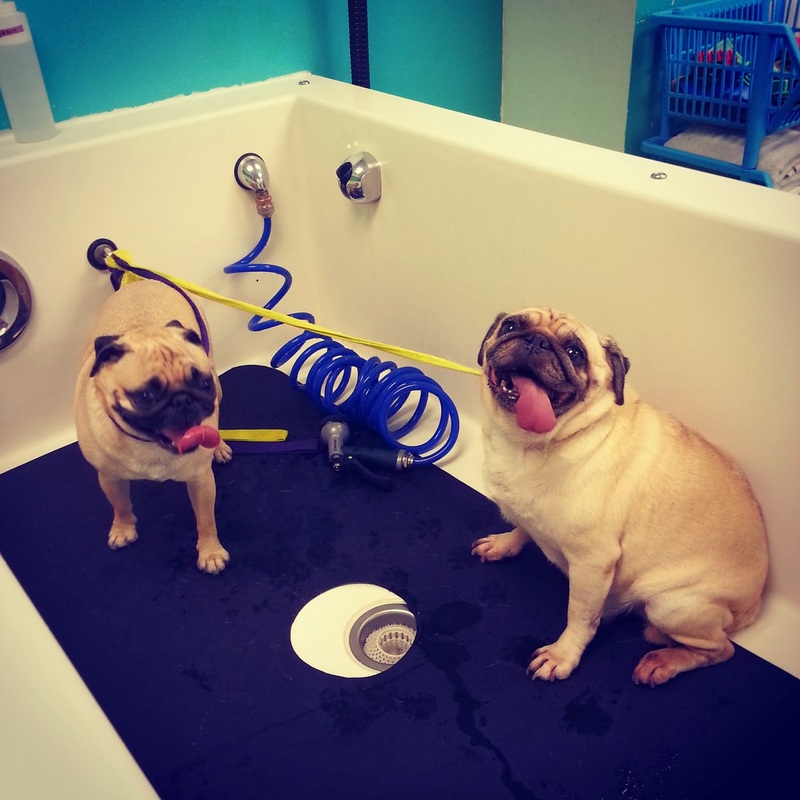 I bathe them whenever they get too stinky and cross the delightful Frito line and enter into the musty puggy smell. I can also usually tell when they need a bath when their fur feels a bit greasier. 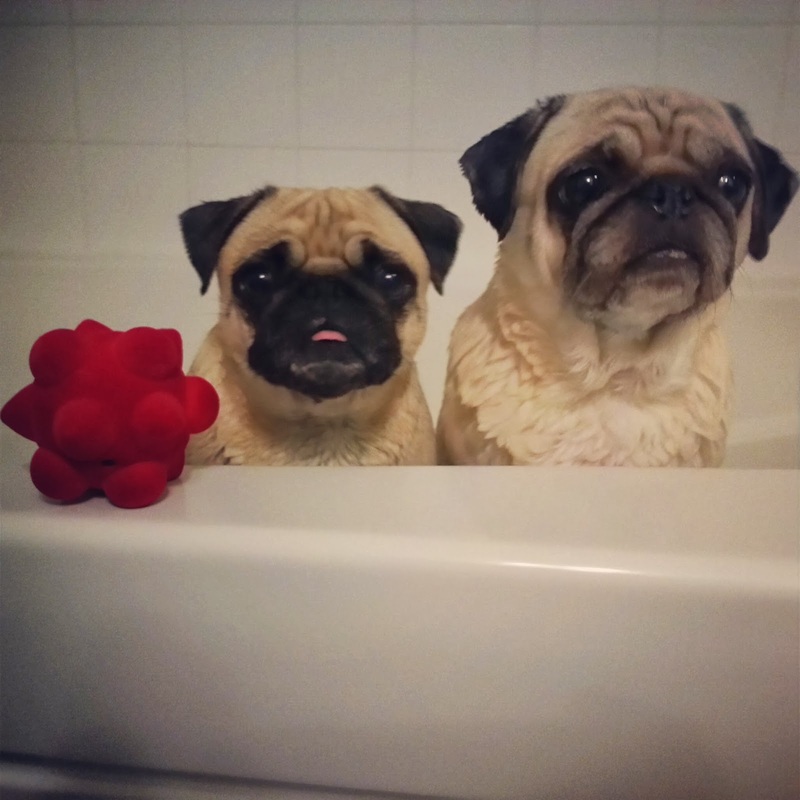 I bathe them more in the summer than in the winter, and will also bathe them when Sunny's allergies act up. And yes, I usually do it myself and it's a huge ordeal! There have been times when I've taken them somewhere to bathe them, especially after a dog park visit as there's a place to bathe them right next door and they provide you with a ton of various supplies. And then sometimes I get lazy or the girls need a thorough cleaning so I take them to the groomers. It's hard to go since I can only go on Saturdays due to my work schedule and their limited hours, and they book up fast. 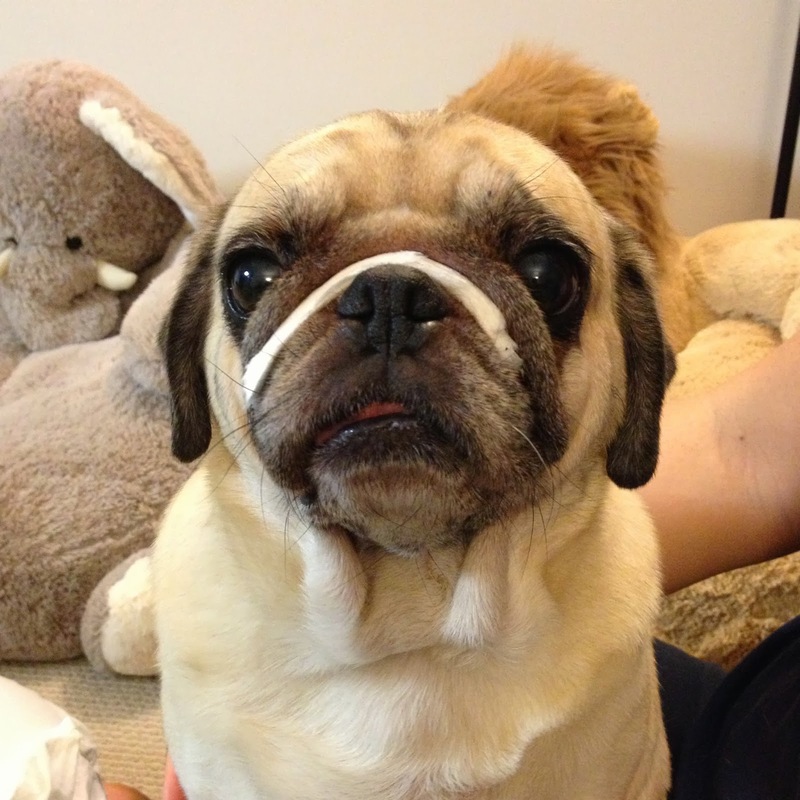 And I do regular maintenance cleaning of the girls' wrinkles and ears. Do you trim the girls' nails yourself? 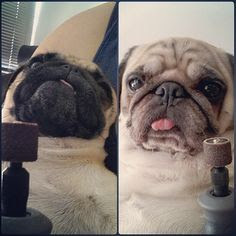 I try to do it regularly but man pugs' nails grow so fast! And Sunny's quicks are so long and won't recede no matter how regularly I trim her nails. When I first got Sunny she flipped out with the clippers so I switched to a dremel (the one I use now is this one). They still resist but it's manageable for the most part. Don't get one of the pet kinds, like pedi-paws or whatever it's called. Those may be quieter but they're less powerful and effective. If the girls' nails get too long, then it's off to the groomers they go! 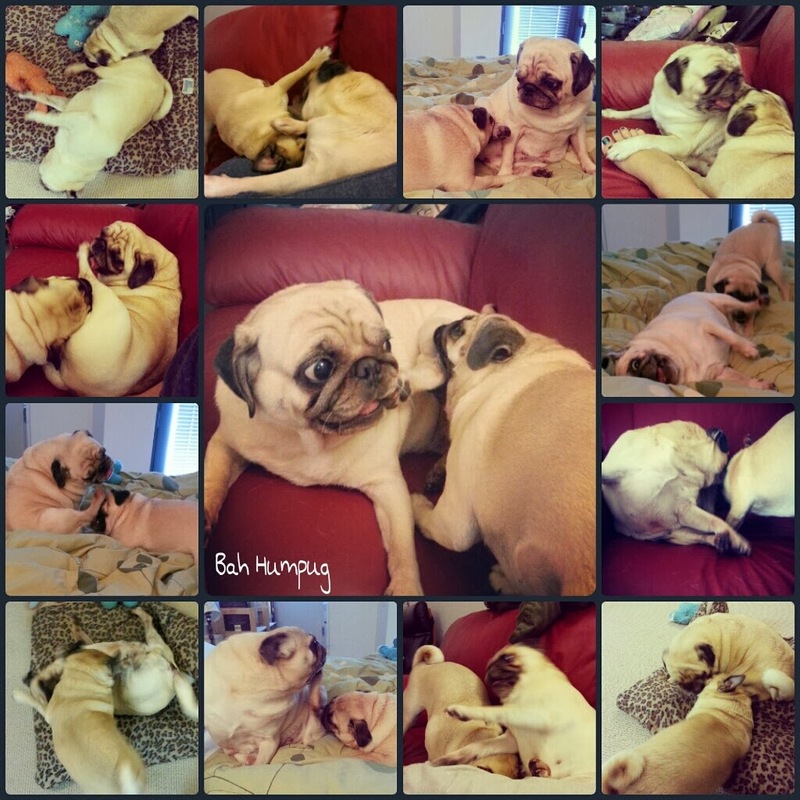 What is with Rosy's drumstick obsession? One of life's great mysteries. But she loves it so. Sunny is a good sport about it for the most part, but once she's had enough she lets Rosy know!